Those individuals with no dental care may suffer from broken, crooked or discolored teeth, cavities and gum abscesses. Not only can these dental problems be painful, but they can negatively affect one’s appearance, and could hurt chances for employment, as well. The Federal Health Resources and Services Administration (HRSA) reports that more than 47 million people in this country have no access to dental care. The agency also reports that low-income adults are almost twice as likely as those with higher incomes to have no dental care in the previous year. Unfortunately in our nation, most employers make judgments based on appearance, and the condition of one’s teeth and smile will affect that judgment. If an individual with broken, discolored, or decayed teeth applies for a job that requires them to interact socially with the public, more than likely, they will not be hired for the position. You need to speak clearly, smile often, and not be embarrassed by your teeth to function in a customer service position. Not only can the condition and appearance of your teeth affect your chances of finding employment, but they can also affect your overall health. 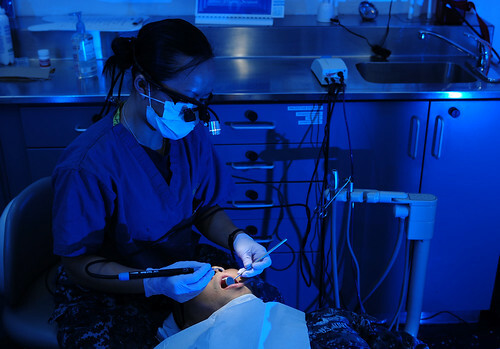 The Centers for Disease Control and Prevention reports the health effects of poor dental care has been linked to heart disease, diabetes and stroke, and acute dental conditions cause employed adults to lose more than 164 million hours of work each year. Unfortunately with more cuts in many state’s dental care programs, many low income citizens are left without oral health services. Provisions of the Affordable Care Act guarantees dental care for children, but not for adults, when it takes effect in 2014. The only hope left for those adults without dental insurance and without the means of paying for dental care, is free dental clinics. One such clinic was held in San Jose, California, last month, sponsored by the California Dental Association (CDA). This clinic ran for two days and more than 2,200 people showed up for the free services. In 2012, because of the generosity of dentists and other dental personnel volunteering their time and skills, CDA events provided about $2.8 million in free care to nearly 4,000 people across the state of California.